This entry was posted in Series and tagged A shot arrow, A year passes by so quickly., arrow, as, fire an arrow, He ran fast and scored a goal., in same way, Like, Like a shot arrow, like a speeding arrow, quick like a speeding arrow, The week went by very quickly. 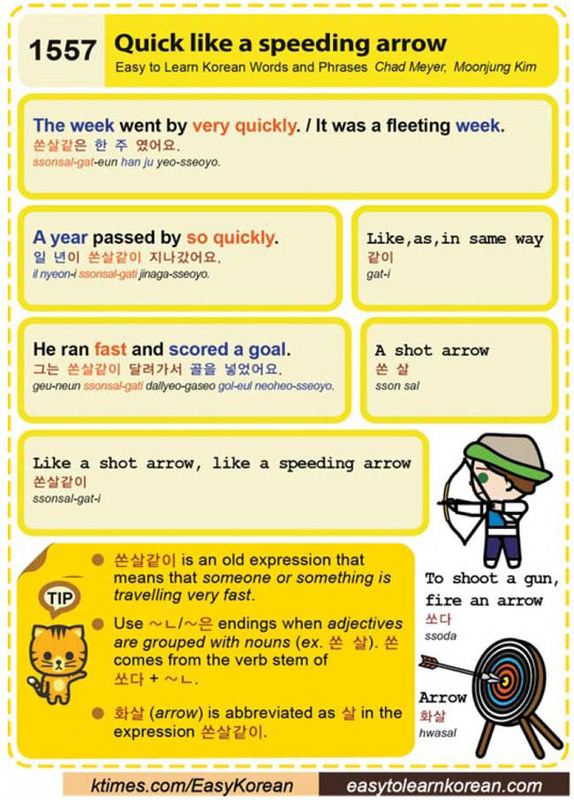 / It was a fleeting week., To shoot a gun, 같이, 그는 쏜살같이 달려가서 골을 넣었어요., 살, 쏘다, 쏜 comes from the verb stem of 쏘다, 쏜 살, 쏜살같은 한 주 였어요., 쏜살같이, 일 년이 쏜살같이 지나갔어요., 화살 by easykorean. Bookmark the permalink.